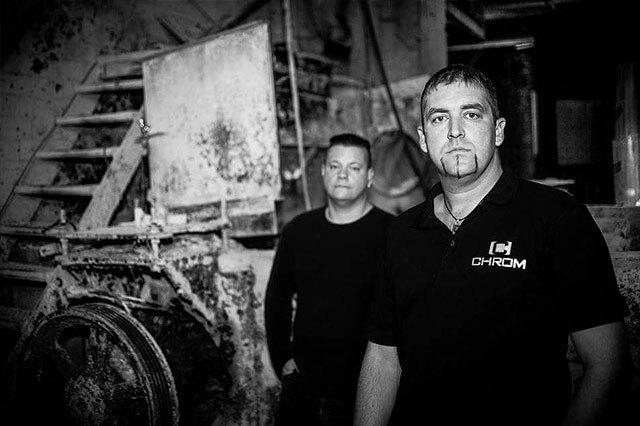 CHROM were formed in May 2007 by Christian Marquis and Thomas Winters, after both discovered their mutual love for solid, club-compatible yet melodic Electro sounds. The group's name is a combination of the two musician's first names (CHRis and tOM.) CHROM stands for an effective synthesis of Synth Pop, EBM and Club-Electro, i.e. : massive beats and powerful bass with a harder edge, garnished with ultra-catchy melodies. The debut album "Electroscope" was released in 2010 on Fear Section, with distribution by Out Of Line to a lot of critical acclaim. The band has since toured repeatedly and highly successfully as support for the Berlin-based legend Blutengel. In March 2012, CHROM released their second outing "Synthetic Movement" on Out Of Line Music, which further elaborates on the group's trademark fusion of Club and electronic Pop music.